BEIRUT (AP) — Taking advantage of the chaos of the civil war, Syria's Kurdish minority has carved out a once unthinkable degree of independence in their areas, creating their own police forces, even their own license plates, and exuberantly going public with their language and culture. But by pursuing their own path distinct from both the opposition and the regime, they are also colliding with Sunni rebels, who have increasingly clashed with Kurdish militiamen. Rebels have besieged a pocket of Kurdish towns and villages in the mainly Sunni Arab corner of northwest Syria for weeks, leading to reports of shortages of food and medicine. The fighting threatens to expand into an ethnic war between Kurds and Arabs, adding another layer to the potent mix of fighters and conflicts in a brutal civil war that, according to the United Nations, has already killed 93,000 people. The ethnic tensions come on top of virulent sectarian hatreds between pro-rebel Sunnis and pro-regime Alawites and Shiites that have spiraled amid the fight for power. 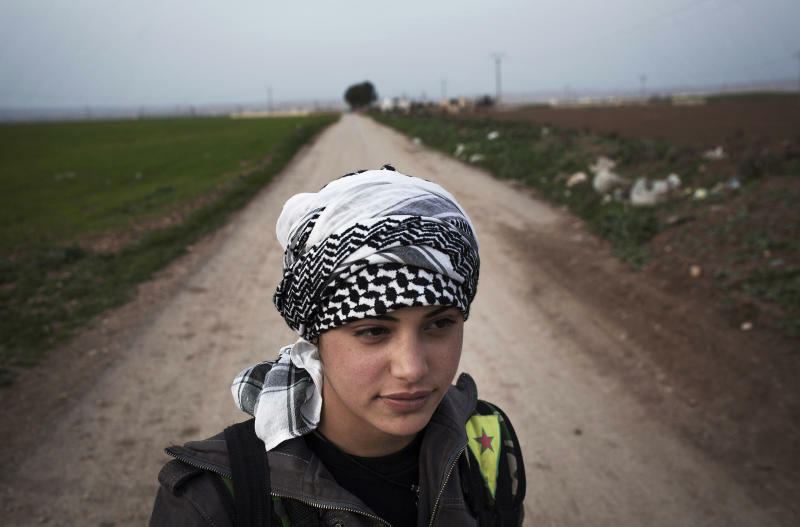 Kurds are the largest ethnic minority in Syria, making up more than 10 percent of the country's 23 million people. They are centered in the poor northeastern regions of Hassakeh and Qamishli, wedged between the borders of Turkey and Iraq. The capital Damascus and Syria's largest city, Aleppo, also have several predominantly Kurdish neighborhoods. Long put down by President Bashar Assad's regime, the Kurds are now exulting in the new, de facto autonomy that they seized. As the fighting intensified last summer, particularly in the northern province of Aleppo, Assad's forces were stretched thin and pulled back from mainly Kurdish towns and villages near the Turkish border, ceding de facto control to armed Kurdish fighters. Over the past year, some Kurds began openly calling for an officially autonomous region in Syria similar to that of northern Iraq. Vehicles sporting license plates reading "Rojava Kurdistan," or "western Kurdistan," have become more common. Kurdish red, green and white flags with a sun in the middle — the same flag flown in Iraqi Kurdistan — fly over homes and public offices. A local police force known "Asayish," whose members include women, have taken over security in the areas abandoned last year by Assad's forces. Kurds now study their own language and cultural heritage in schools. Under Assad, Kurds have not been allowed to openly teach their language or celebrate their New Year, or Nowruz, and Kurdish activists were routinely jailed. "There was a political vacuum and it was filled," said Mustafa Osso, secretary general of the Azadi Kurdish Party in Syria and a senior member with the National Kurdish Council, an umbrella to 15 groups. "A future Syria should be democratic, pluralist and cannot be ruled by a central government any more. We want to propose a political program that Syria be a federal state like Iraq," he told The Associated Press. But Kurdish gunmen and rebels have fought several pitched battles over the past months. Since late last month, rebels have laid siege to a predominantly Kurdish pocket around the town of Afrin, northwest of the city of Aleppo. In a statement Monday, the Britain-based Syrian Observatory for Human Rights warned of shortages of food, milk and medicine in the Afrin area. It said hospitals in the area are concerned about the spread of tuberculosis because of a lack of medicines. The Afrin region, halfway between Aleppo and the Turkish border, has a population of more than half a million, along with more than 200,000 Syrians who fled there from fighting elsewhere, said the Observatory, an anti-regime group that has a network of activists on the ground. The Afrin assault began when rebels wanted to pass through it to attack the predominantly Shiite villages of Nubul and Zahra, controlled by Assad loyalists, the head of the Observatory, Rami Abdul-Rahman, said. After Kurdish groups refused, rebels attacked Kurdish checkpoints and laid siege, beginning May 25. Dozens have been killed on both sides in the clashes since, he said. Kurdish groups in the area are mostly secular, while the rebels in the northern regions are made up of Muslim extremists, including al-Qaida-linked Jabhat al-Nusra. "There is no trust between the two sides," Abdul-Rahman told The Associated Press. "There are efforts taking place to prevent a bigger war that could burn the region." The fighting reflects in part the Kurds' complicated response to Assad and the uprising against him. When the revolt began in March 2011, some Kurds joined in the peaceful protests against his rule. Assad also tried to keep the community on his side by ceding ground on a major Kurdish demand, granting citizenship to some 200,000 Kurds who were registered as aliens before. The Kurds long complained of discrimination, and many of them were denied citizenship, making it difficult for them to find work or enroll in the state-run education system. Kurds' suspicion of the opposition — increasingly dominated by Islamist fighters — kept many on the fence, much like members of other minorities like Christians. Fearing the future if Assad's secular regime collapses, Kurds have not thrown themselves into the armed uprising — beyond carving out their own interests. The Kurds are also hampered by their own divisions among multiple factions, one of which is accused of openly siding with Assad's regime. Some Kurds say that the pro-government militia of the Kurdish Democratic Union Party, or PYD, is indirectly enforcing Assad's rule in several Kurdish areas it took over last year. PYD, Syria's most powerful Kurdish group, is affiliated with the PKK, rebels who were fighting for autonomy in Kurdish-dominated southeastern Turkey. The clashes between the two sides have involved PYD militiamen and extremist rebels, and the exiled opposition accuses the regime of stoking the tensions. "The regime wants a sectarian war between Alawites and Sunnis and an ethnic war between Arabs and Kurds so that it appears to be everyone's protector and to say that the substitute (to the regime) would be chaos and infighting," said Abdelbaset Sieda, a senior Kurdish member of the main Western-backed opposition Syrian National Coalition. "We are in contact with all parties to calm the situation and to consolidate all efforts against the regime," Sieda said. The tension first began last summer when rebels captured several neighborhoods in the city of Aleppo. When the rebels reached the predominantly Kurdish neighborhood of Achrafieh, PYD members controlling the district told them not to enter. Some rebels accused the PYD of being collaborators with the regime. The Kurds accused the Arab rebels of wanting to dominate their neighborhood. The friction in Achrafieh was followed by clashes in Afrin, Tel Abyad, Hassakeh, Qamishli, Ras al-Ayn and Tel Tamr near the border with Turkey. The two sides clashed in Ras al-Ayn for three months until a cease-fire was reached in February. 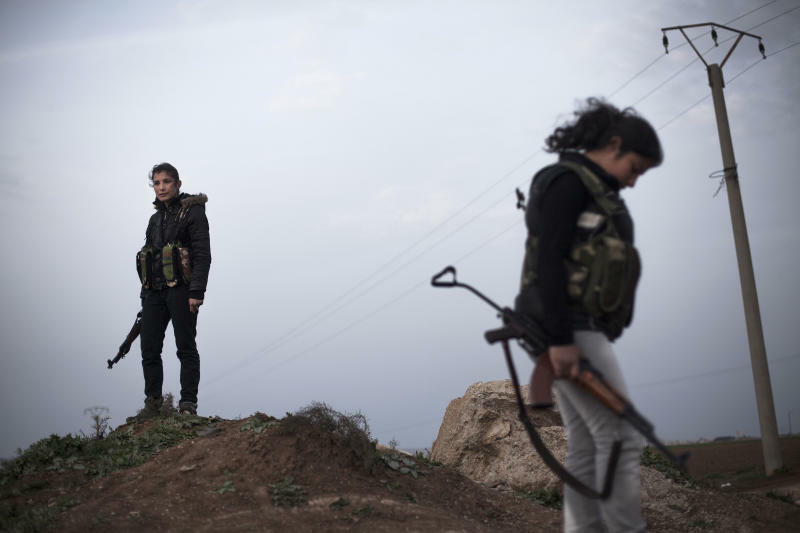 Kaniwar Ayani, 28, an activist in Ras al-Ayn, said hard-line Islamist rebel factions are seeking to dominate the Kurds. When rebels entered the town, they prevented residents from raising any flag other than the militants' black banner with Islamic slogans, he said. When they went on mosque loudspeakers to demand Kurdish fighters surrender, the Kurds decided to stand up against them. "The Islamic groups entered Ras al-Ayn to liberate it but they stayed to impose their will," Ayani said. Many in the opposition react to Kurdish demands much like the Assad regime always has. They see the demands for autonomy — or even for greater rights — as an attempt to split the country. One point of friction is also control of oil fields in Hassakeh, especially the Rumailan field, currently held by Kurdish gunmen. 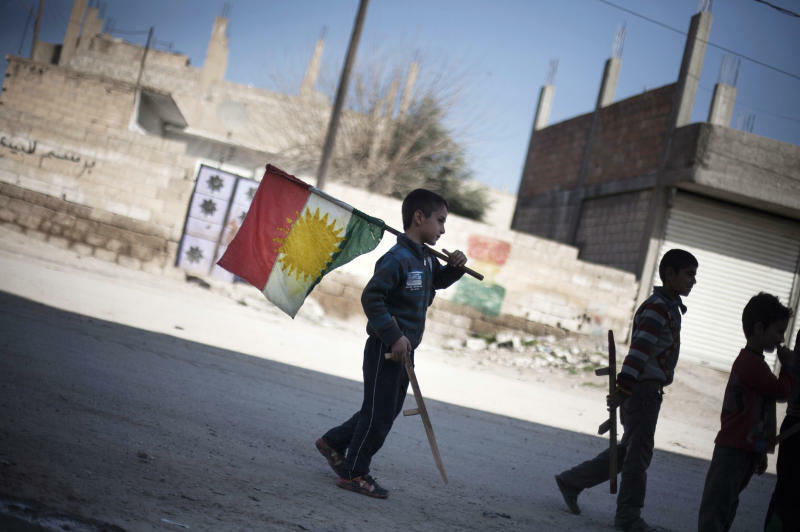 Kurdish autonomy in post-Assad Syria, similar to the Iraqi model, could strengthen long-standing demands for an independent homeland for the more than 25 million Kurds in parts of Turkey, Iran, Syria and Iraq. "As Kurds, we have a right that we have been deprived from for decades. I frankly dream of a Kurdish state," said university student Shayar Aziz, 24, from the Kurdish town of Amouda. A Syrian journalist in Ras al-Ayn, Syria, contributed reporting.